On April 4, members of the Knights of Columbus held their Pride in Our Priests Dinner at The Palace in Blackwood. 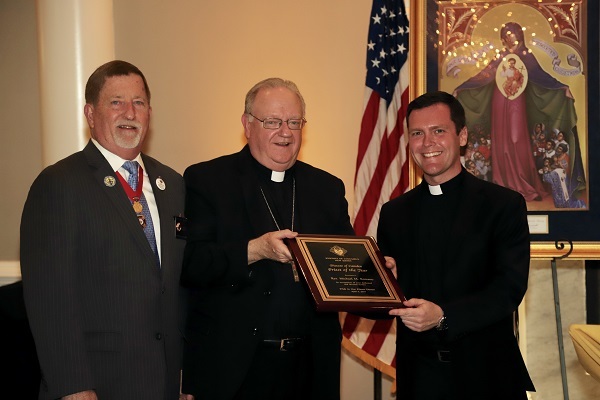 In addition to once again donating to the diocesan seminarian program, the Knights reinstated their annual Priest of the Year honor, which was awarded to Father Michael Romano, director of Vocations and Bishop Dennis Sullivan’s priest secretary. Only a few weeks ago, on Feb. 17, Bishop Dennis Sullivan was one of 93 men installed as a member of the Fourth Degree. “It was a beautiful and heartening ceremony, as all Knights of Columbus ceremonies are. I can say that I am proud to hold the title of Sir Knight,” the bishop wrote in an open letter encouraging men to learn about the Knights. “I know of no finer Catholic men’s organization than the Knights of Columbus,” he wrote. — In 1882, Catholic immigrants were facing hostility and were thrown into dangerous work conditions which could cause early deaths. Father Michael McGivney, 29, gathered the men of Saint Mary’s Church in New Haven, Conn., to found a lay organization on the principles of charity, unity and fraternity. The goal was to unite men of Catholic faith and provide for the families of deceased members. — Father McGivney is a candidate for sainthood. His cause for canonization is open, and he was given the title “Venerable Servant of God” by the Holy See in 2008. — With nearly 2 million members and over 15,000 councils worldwide, the Order is still true to its founding principles of charity, unity and fraternity. — Knights are active in the U.S., Canada, Mexico, the Philippines, Dominican Republic, Poland, Panama, Guatemala, Lithuania, Bahamas, Saint Lucia, South Korea, Ukraine and more. — There are 374 K of C councils on college campuses around the world. — The insurance system established by Father McGivney has evolved into a top-rated Fortune 1000 insurance program, with a financial strength rating of A+ (Superior) from AM Best, and over $100 billion of life insurance in force. Knights of Columbus Asset Advisors offers a suite of faith-based investment solutions for Catholic investors. — K of C’s investment team managed approximately $24 billion in assets related to these businesses as of the most recent quarter end. These strategies are managed in accordance with Catholic moral principles. — 2017 was a record-setting year for Knights of Columbus charitable work with an unprecedented $185.6 million in donations and 75.6 million hours of service provided worldwide. — K of C donated $1.62 billion to charitable causes over the past decade (as of December 2017). — The Order produced a 280-page report detailing the genocide against Christians by ISIS, which was decisive in getting the genocide recognized by the U.S. State Department. — The Knights are saving a Christian town in Iraq that was desecrated by ISIS and raising $2 million to save Karamles, a town recently liberated from ISIS. — The Order has been assisting in the construction of McGivney House, a 140 unit apartment building that will provide housing for both Syrian and Chaldean families. — K of C has been instrumental to the annual event since the very first one in 1974. — Since 2009, the Knights have funded 950-plus ultrasound machines at pregnancy care centers in all 50 states. The K of C’s goal is to reach 1,000 machines soon. If each machine saves the lives of just four unborn children each week, the Knights will have saved more than 1 million lives. — The Knights have been a major supporter of the Special Olympics since the very first games, and have raised and donated more than $600 million and 4 million volunteer hours to the Special Olympics. — Several Knights have already been declared saints. Saint Luis Batis, Saint Rodrigo Aguilar, Saint Miguel de la Mora, Saint Pedro de Jesús Maldonado, Saint José María Robles and Saint Mateo Correa were martyred during the persecution of Catholics in Mexico in the early 20th century. 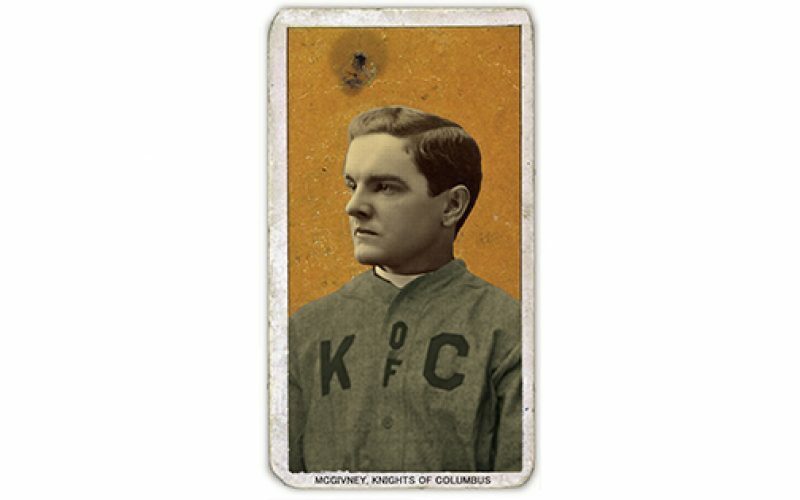 — Babe Ruth, Vince Lombardi and President John F. Kennedy were all members of the Knights. — Patriotism is the fourth pillar of the K of C, following the founding principles of charity, unity and fraternity. — The Knights were instrumental in lobbying for the words “under God” to be added to the Pledge. — This year, the Knights sent more than 200 pilgrims to the Marian shrine in Lourdes, France for a time of rest, prayer and healing as part of the annual Warriors to Lourdes pilgrimage. — Both the first American and the last American to fall in World War I were Knights of Columbus. — A major supporter of vocations, K of C councils “adopt” one or more seminarians and provide them with financial assistance and prayer through the RSVP program. — A major initiative of the K of C, the Saint John Paul II National Shrine in Washington D.C. has a first-class relic of JPII’s blood, and it is a great place to venerate the saint and remember his legacy.